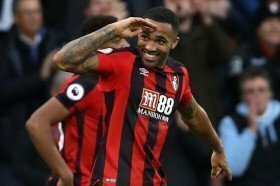 Bournemouth have reportedly told Chelsea that they would need to pay at least £75m in order to prise away Callum Wilson from the South Coast this month. The Blues are said to be in the market for attacking reinforcements amid the uncertainty surrounding Alvaro Morata's future and Wilson has been identified as one of the leading targets. According to The Star, the Cherries could be prepared to discuss a mid-season deal for their leading marksman but only if the Blues are prepared to cough up a club-record £75m fee for the Englishman. Wilson has been in top form for the Cherries during the ongoing campaign and he has already contributed 10 goals despite missing a few games through injury. Watford and West Ham United have also been credited with an interest in the marksman but they are unlikely to come anywhere close to the Cherries asking price. Chelsea are currently holding a three-point advantage over both Arsenal and Manchester United in the pursuit of the final Champions League qualification spot.